In a medium saute pan over medium high heat, drizzle pan with olive oil and add sugar snap peas. 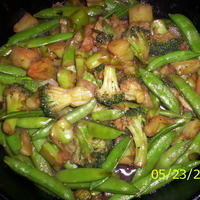 Saute for about 30 seconds and add broccoli. Saute until tender crisp, about 3 minutes. Add hoisin, brown sugar and fish sauce and saute for about 30 seconds more. Add a splash of rice wine to de-glaze and remove from heat. Toss to coat and season to taste. For more protein toss with 2 c. shredded roasted chicken or 8 oz. julienne of beef, sauteed for about 3 minutes. Serve over rice for a filling meal!